Microban protects cart shelves from bacteria, mold, and mildew that cause odors, stains, and product degradation. Keep shelves “cleaner between cleanings”. Impact resistant shelves will not chip, peel, or dent. Rounded corners reduce damage to walls and surroundings. Ergonomic handle is designed for easy use. 2-3/4″H (70mm) ledge contains product and spills. 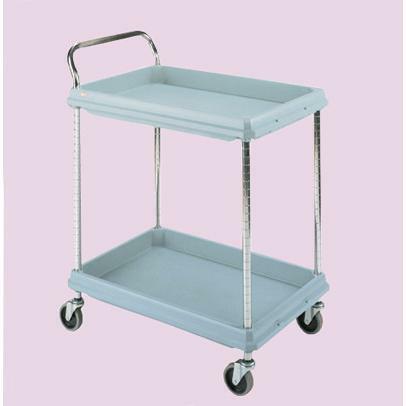 Versatile: middle shelf on 3 shelf cart is adjustable in 1″ (25mm) increments. Four 4″ (102mm) diameter, resilient rubber swivel stem casters. Easy to Clean! Smooth, injection-molded shelves wipe clean easily.